Another one of Thomas Edison's stencil pens showed up for sale on Ebay recently. This device is often described as "the first electric motor driven appliance produced and sold in the US." This is not easy to prove, but sure sounds good! Of course to the tattoo world this stencil pen is the grandfather of all electric tattooing machines. The one on Ebay was listed as "Buy it Now" for $35,000. The last time I checked there were no takers, but it got me to thinking more about the machine's inventor and builders. Edison held at least four different US patents for his stencil pen ideas. The first was issued on August 8, 1876; this was an abbreviated version of the patent he had received one year earlier in England. Edison took some of the other ideas from the English patent, and in 1877 and 1878 got US patents for them. The most popular of these machines is the 1876 version and to our knowledge, machines from the other three patents have never been seen. For many years the tattoo world thought there was only a couple of these 1876 machines in the world, but thanks to the marvel of the Internet and Bill Burns, we now have the electric pen registry (http://electricpen.org). That's right! According to Burns' research there are at least 28 of Edison's stencil pens known to exist. Many can be found in national museums and private collections, but we know of at least three in private tattoo collections. Thomas Edison had enough genius to know that he need educated, hard working, dedicated people to be his hands in the laboratory. Unlike many inventors, Edison depended on these "muckers", as Edison like to call them, to do the somewhat tedious work of building and testing his many inventions. Remember Edison had over 1,000 patents to his name. Edison was the idea man! These muckers came from all over the United States and Europe to work with him. Some were just out of training schools or college but what they had in common were that they were all chasing their dreams. The pay was not great but the opportunities were many and most of these people spoke highly of Edison even after they left his employment. 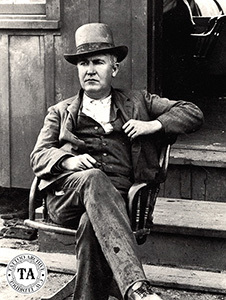 Many of them were patents holders themselves and were able to work their way up the ladder to executive positions in one Edison's many businesses at home and abroad. Often called Edison's right hand-man, Charles Batchelor (1845-1910) was involved in many of Edison's projects, including the electric pen. Batchelor was born in England and first came to the United States working for the Coates Thread Company. He met Edison and soon became one of his most trusted partners. In Batchelor's personal technical notes & drawings it is obvious that Batchelor had a lot of input in the design of the electric pen. Batchelor worked his way up the Edison ladder and became an investor and manager of several of Edison electrical companies. An interesting side to this story is a note in the Edison Papers that Charles Batchelor wrote to his brother Tom (no last name given) in Manchester, England where he told Tom all about the electric pen and it workings. For years a story has circulated in the tattoo world that Tom Riley, a well-known English tattooist, patented a tattoo machine in the late 1800s. Tattooist George Burchett even talked about the Riley machine in his memoirs. This Riley patent has never been found. Could Tom Riley be Charles Batchelor's brother?Could Riley have been bragging about his brother's work and that's how the story of Riley's patent got started? We might never know! John Ott (1850-1931) seems to be the mucker most involved with the hands-on building of Edison's stencil pen. John and his younger brother Fred were machinists who went to work for Edison in Newark, New Jersey in the 1870s. 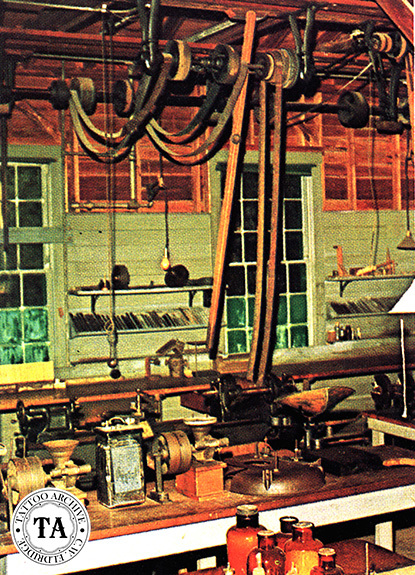 John Ott became Edison's principal model and instrument maker after the move to Menlo Park, New Jersey in 1876. He was also the superintendent of the machine shop in West Orange in 1887. 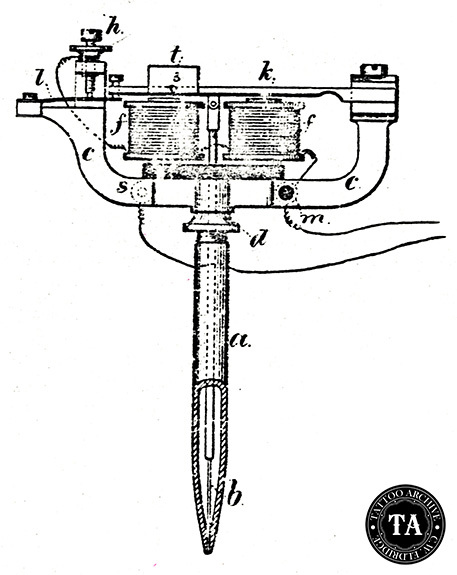 Bill Burns's research led him to believe that John Ott was instructed by Batchelor to make the first of the electric pens on September 6th 1875. The first batch was made by hand with Ott doing the tooling of this first production run. At this time Ott was working in Edison's Newark shop. The stencil pen included a duplicating press and ink roller which was made by Gilliland & Co. in Menlo Park. Once regular production began, Gilliland took over all the manufacturing and operated as the Electrical Pen & Duplicating Press Co. In November 1876, Western Electric took over production of the pens from Gilliland. In 1895, John Ott suffered a terrible fall and was severely injured. He spent the rest of his life using crutches and a wheelchair. Ott died on October 19, 1931, the day after Thomas Edison's death. The story goes that at Mrs. Edison's request, Ott's wheelchair and crutches were placed by Thomas Edison's casket.